It is now nettling time for those with iron fingers and /or amazing gloves. Brian will only pick them when they are short and young and haven’t got too dark in colour, he says his Dad picked them like that and they get too strong later on. He is very picky (sic) about his nettles. 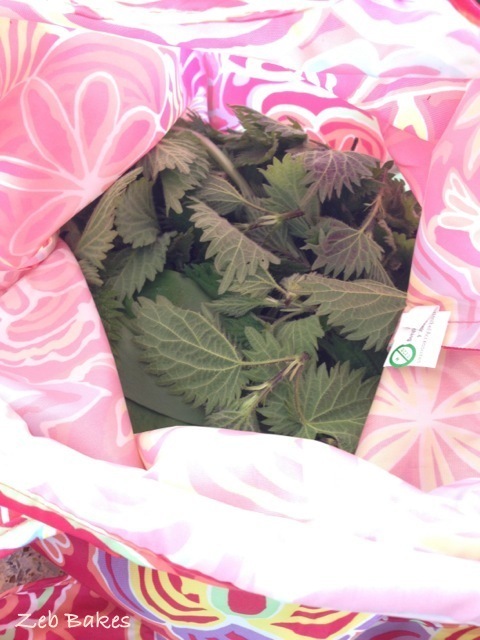 So today I was a bit sneaky, I suggested a walk off the beaten track and secreted one of those fold up shopping bags around my person, then pulled it out with an nonchalent air when I saw some potential nettles and asked politely if he would pick some for me. He obliged, the dogs ate grass and avoided the nettles and I picked a small bunch of wild garlic leaves and flowers and watched and waited for him to scream; he never does. The original plan was to make the nettle gnocchi that we had made some years ago and maybe some soup but on visiting Twitter I saw a tweet that Carl had written an article about Spring Foraging in the Guardian and I had a look at it and lo and behold there was a recipe for nettle pizza so that was what we had to try. 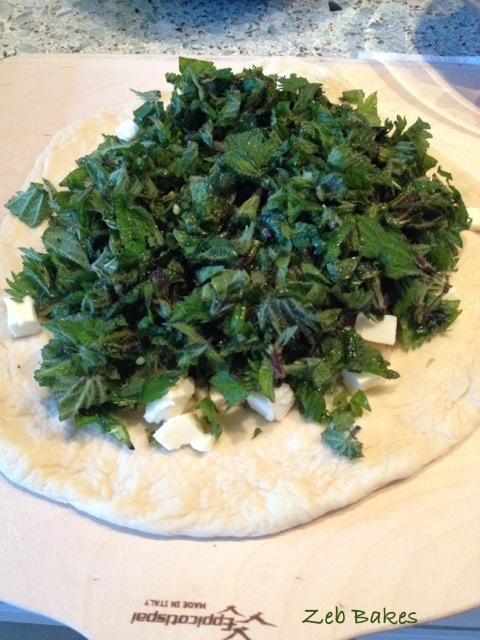 I made a quick pizza dough, persuaded IronFingers once more to deal with the nettles, wash, spin, chop, and season. I fished my wild garlic out of the bag and promptly stung my finger on a hidden nettle just waiting with barbs hovering to bite my delicate little finger. Ow Ow! 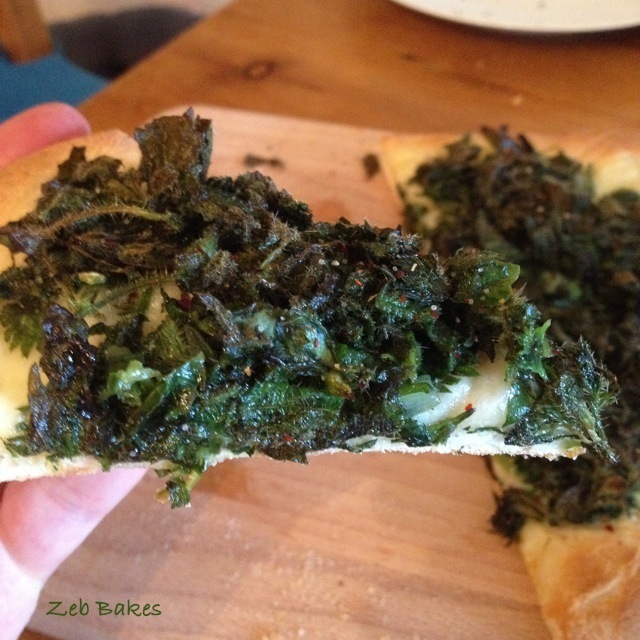 We seasoned the nettles as Carl suggests – those chilli flakes are essential! – and substituted the wild garlic for the garlic cloves as we had picked some of that too and then, baked away and stuffed our faces. I have to say that I thought the nettles would shrivel up like kale does when you make crisps but the seven minutes in a hot hot oven just cooked them beautifully and the combination of chilli flakes and nettles and melty mozarella was a complete and utter delight! 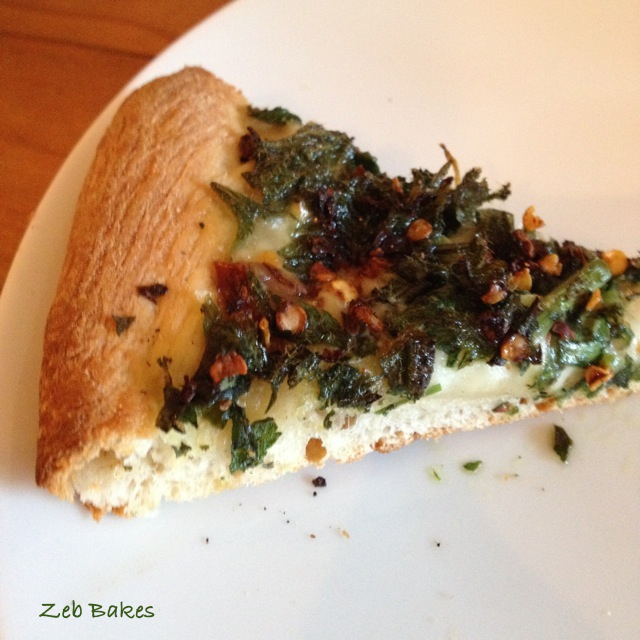 Carl calls this a ‘permie pizza’ in his new book The Permaculture Kitchen. It has great photos and an engaging tone and lots of recipes which encourage and inspire you to think creatively and use what you have and use a few things that you would never have thought of. I bought a copy as soon as it came out, because I like to read books that friends write and even though we have never met in person, there is something about Twitter and the kindness and generosity of people like Carl and his wife Debs that make the world spin a little sweeter. PS I am experimenting with these Gallery settings, I have tried various permutations, currently trying the full scale carousel. Do you like the Galleries? I think they load better on smartphones etc, but I don’t know what you think? Do let me know if you have an opinion. Thanks! No they are soft and very vegetal is the only the way to describe the taste, they have a unique smell/taste. I love them and they are truly seasonal and once they are above about eighteen inches off the ground B says they are too old, he only picks the top two pairs of leaves as well, to make sure he takes the tenderest leaves. Though stinging nettles were the bane of our childhood games in Hamburg, I like the taste, and made nettle soup and nettle quiche (not pizza, though). They don’t grow here in Maine, and neither does wild garlic (sigh! ), a very popular herb in Germany. 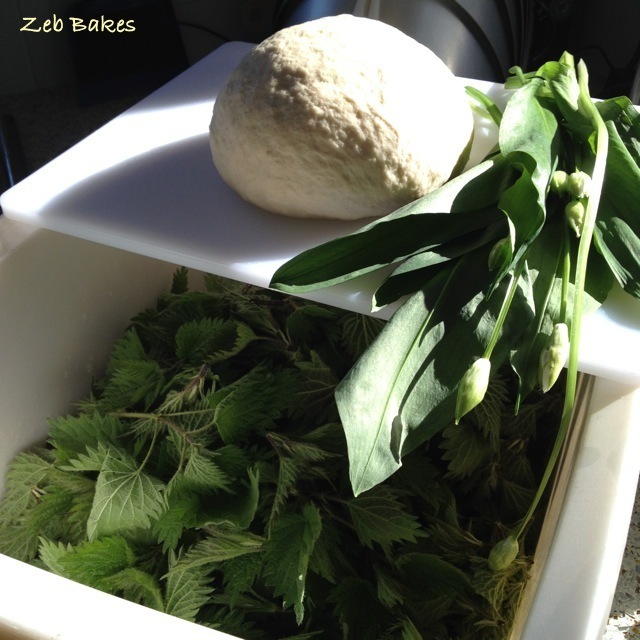 Did you know that nettle is a great fertilizer? 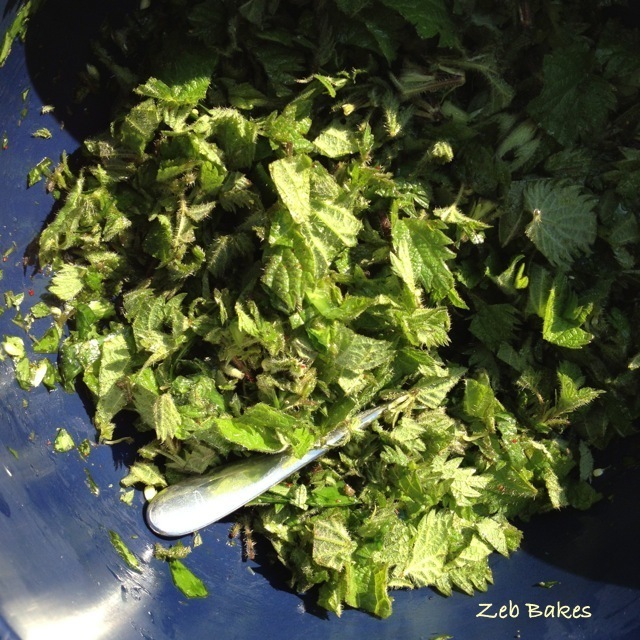 You only need to cover nettles with water, and leave it to ferment – it doesn’t smell good but works great. How funny that nettles don’t grow in Maine, I would have thought they would grow everywhere. I too have tried growing the garlic from seed but I have had better luck with a couple of bulbs in pots, though they haven’t reproduced very fast in my garden. I think they are quite fussy and then when they like somewhere they take it over. I don’t have any nettles in my garden so would have to pick them elsewhere to use as fertiliser. I have heard comfrey is also good but invasive as a plant. Happy Easter to you too Karin! What a coincidence I’ve just been sent a recipe for nettle pesto and nettle omelette with sharp cheddar. 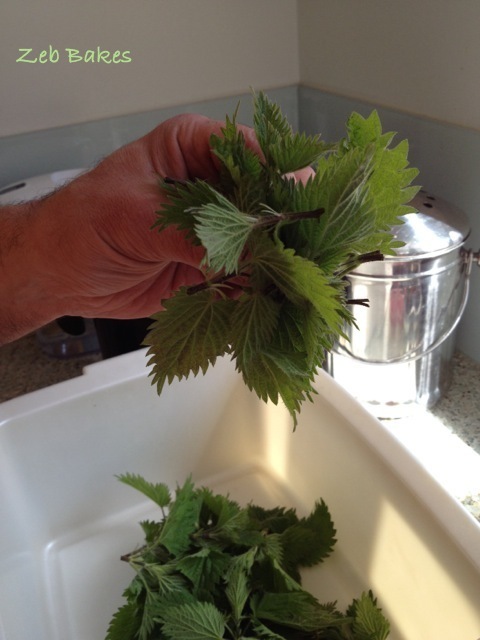 Like Mr Ironfingers I can pick nettles as long as they don’t touch the back of my hand; my finger pads seem immune. 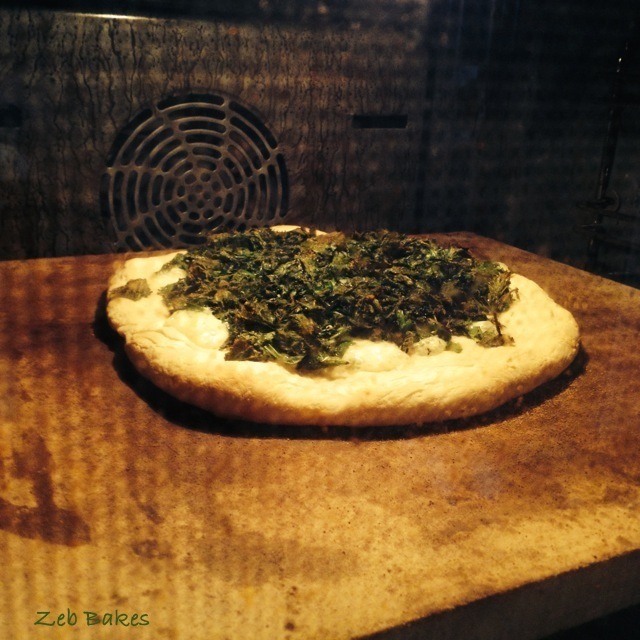 I remember that post, and of course I am pretty intrigued by this pizza as far as taste and texture goes…. they do look like kale (which I love) but seem to behave in a different way under heat – pretty interesting, now I would love to have a slice of your pizza! Hope you are headed to a spectacular weekend! I’ve intended to go out and pick nettles many times, but have yet to do it! However, with your urging, I think I’ll try again very soon – as I read both you and Carl, I determined to make a wild forage soup with nettles, mushrooms, and clams and mussels – I think that should make a good soup, don’t you? Have a beautiful Easter, amiga. I well remember stinging nettles but neither they nor wild garlic grow here in WA. Dock leaves were supposed to cure the sting and always seemed to grow nearby – very handy. Liked the pic of Zeb at his little roundhouse! No dock leaves in the garden here, or nettles that I have spotted so far, but they do pop up sometimes! Happy Easter to you too Ann! I hope you enjoyed your pizza Lorraine. I had forgotten how good the nettles are, we all need inspiration ! I have only bad memories of stinging nettles- my family wasn’t much into foraging when I was young and the nettles grew up next to the raspberry bushes next to our side garden. Now that I said that, I remember many dishes of dandelion greens that had to be picked when they were a certain height and before they bloomed- so I guess we did some foraging after all! Your pizza looks wonderful- I wish I could have a taste. And I’m happy to hear you used mozzarella- so many go for the goat cheese with a green veg that I’m thinking that it has been a bit overdone. I like a salty and stretchy cheese on my pizza= mozzarella and provolone, please. Love the photos and loved the pizza recipe :) Will have to see if Big Man is as brave as Mr Ironfingers because I know I’m not! Gloves at all times till they have been wilted or cooked and then magically their nasty little stinging hairs are rendered harmless. I have cooked the remainder up into a big batch of leek and nettle soup and stashed in the freezer. I love nettle soup! this looks utterly delicious. I’ve heard much about the virtues of nettles and even dandelions. Even more reason to take a walk, except i’m such a useless urbanite I can’t tell one species from another! I like the gallery setting. You’re very good to do ‘process’ shots. It’s always nice – and useful – to see how something comes along, and readers can zoom in if they like. There is something delightful about cooking with nettles, a frisson, not quite fugu blowfish ;) Maybe one day you could go out on a walk with someone who knows their wild plants, or even a fungi walk? i just snap away with whatever I have to hand so am pleased you like the gallery setting. I hope it makes it quicker to load the page and have a peek and then as you say up to you if you want a closer look. Thanks for the feedback ! Stinging nettles are abundant where I live. As a child learned how irritating the sting was so and I have always avoided contact with them. Now I’m looking at them in a new way. 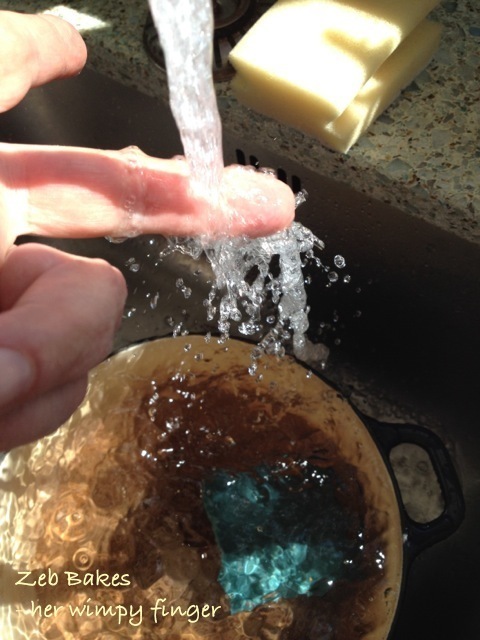 Maybe it’s time to don gloves, harvest some, and ask hubby to try this pizza recipe.